Early this year I was really trying to find new long term investments, that I could hold for years and years. I thought I had come up with a very defensive and good investment idea. From my perspective it also seemed somewhat overlooked by the market. Great long term tailwinds with a increasing old population that will eventually pass away. The old generation is also wealthier than before meaning they would leave all that money and assets behind. All boding very well for a nice structural position for listed funeral companies in my view. Great invesment case, stocks were a bit expensive, but given these fundamentals that mattered less in the long run. So i invested, in one UK listed and one Hong Kong listed funeral company. What I didn’t forsee was that governments would come in and have a view on how expensive funerals should be. I have come to realize that society sees this as a service in line with schools etc. For these types of services it is not accepted to make large profits in the same way as for things not everyone needs. After seeing comments like these about Chinese funerals and what has happened lately in UK I started to look at this in a different way. Looking at it from this light, this will perhaps not be a great long term investment, even though demographics guarantee that demand will be there. With the above thesis of great tailwinds I bought into Dignity early this year at 18.8 GBP per share, only a few days later the stock plummeted with 50%. This was on the back of tougher price competition and that Dignity decided to change their pricing strategy. At the time I thought this was a big over-reaction by the market and a great buying opportunity, so i doubled up: Double Pain & Doubling down in Dignity At 8.7 GBP per share I bought as many shares as I bought at 18.8. The strategy seemed to do fairly well at first, the stock recovered and set a high around 13 GBP per share, on my average I was not really even down that much. Then came the next hit, the UK CMA decided to look into the British funeral market and the pricing of funerals, the stock took another dive. Today a clarification around this came out: “Nov 29 (Reuters) – Britain’s funerals industry could face formal investigation after the UK competition watchdog found that high prices were taking advantage of grieving families.” Link to article: Reuters article. The stock is currently down -17% on the day and back trading around the same price I picked up more shares. All in all a disaster investment for me. This all has made me realize I have misunderstood this segment. Given that the kind of thinking from UK CMA is probably even more true how the Chinese think, I decided to divest in both my funeral stocks (Dignity and Fu Shou Yuan) as of close today. I still see the structural tailwinds and defensive characteristics of these stocks as attractive. But these markets UK and China, will most likely not allow this companies to be highly profitable for the long term. Fu Shou Yuan has not been an equally terrible investment, but also a loss. I bought it for 6.49 HKD per share on the same day as Dignity on Jan 15th and I sold today at 5.9 HKD. Which is not terrible given that Hang Seng is down -15% for the same period. But given that Fu Shou Yuan was trading above 9 HKD in June, it again feels like pretty poor timing on my side. This stock has been strangely volatile and I didn’t really understand why it went up (or down afterwards). The Hong Kong market has been extremely peculiar this year though.. So I am a bit bruised by these investment mistakes. You always learn something from your mistakes and here was another angle to consider. A similar story has taken place for my gaming stock NetEase, which was on real roll, until the Chinese government froze all new game launches in China. This has hurt NetEase a lot and it’s greatest rival Tencent. These kind of out-of-the-box disturbances from politicians and governments is not just disrupting in terms of Trade War, but most obviously also be considered from a more narrow sector perspective. As always the market is good at keeping me humble. Now on and upwards to new investment ideas. Stay tuned for a Part 2 of my dental series! I had several sector themes in the past and some of them are still in my portfolio (EV’s, breweries, funeral). My most well covered theme has been Electric Vehicles. It’s time to learn about a new niche segment of the market. Over the past year I have spent a lot of time looking in to many different Pharma/Biotech/Healthcare related companies. Unfortunately it has not yielded in anything I can confidently hold long term. 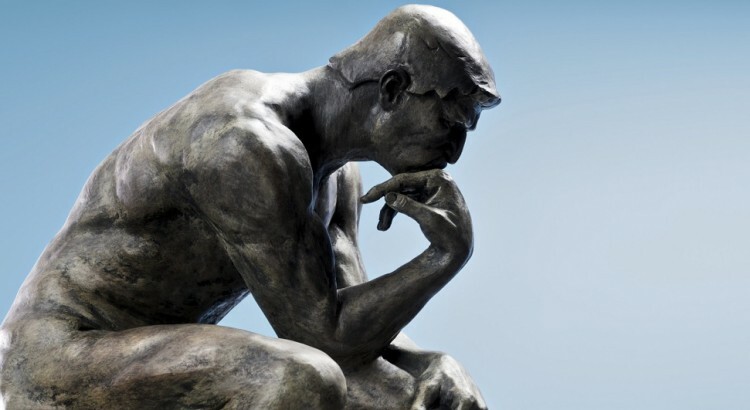 I thought I had an investment case with Teva, which I spent a lot of time researching (Teva – The Perfect Storm in 2 parts) but at the later stages of my analysis I decided not to. The main reason why I in general have such a hard time pulling the trigger on a Health related investment, has been the research pipelines. These Phase I, II & III research pipelines often drives most of the value in these companies. I just feel I never have an edge, in understanding the probability, if a product is going to pass through these stages. In the search for something more understandable but still healthcare related, I ended up with dental care. Although still complex, I think this is a niche which is understandable and therefore for me – more investable. Some segments and markets in the dental services industry has very attractive investment dynamics. First of all it’s generally very defensive, especially in countries where dental care is government sponsored or part of a health insurance. Second, is demographics and economics, the world is getting older and we also live longer combined with increasing wealth. Old people need dentures and implants, and reaching a certain level of wealth, you start to take care of your teeth in another way. These two factors create a significant long term tailwind for these products. Third, it is a very fragmented market, with custom made products. This creates a very low price transparency for the end customer, it will take a long time before end consumers have proper price comparison, for dental services. In many cases it’s also not needed, given government sponsorship or insurance covering the procedures. This will be a multi part exploration in understanding the dental sector and the investable players in that space. If any of you readers happens to be a dentist or just have deep knowledge in the sector, please do help out over the coming posts to explain the dynamics of the industry. It is very hard to get a good global industry overview. First of all because of scarcity of data, secondly because different sources group different products and services in different ways. I have done my best to pull together a industry overview from a number of sources. 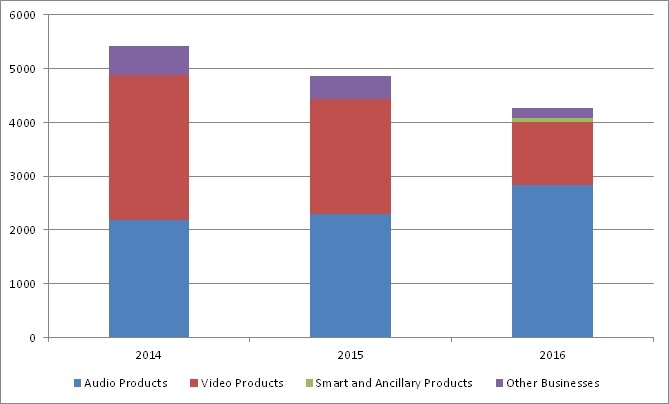 Most of the industry data is from 2014-2015. Dental Services – All products and services when you visit the dentist (teeth check-up, tooth filling, dental implants, cosmetic changes, xray, etc). Oral Care products – All products and services outside the dental clinic (toothbrush, toothpaste, dental floss, mouthwash, etc). Although a large market, I will leave this segment for now, this series will focus on Dental Services. Tooth decay (dental caries) is the most widespread chronic disease worldwide and constitutes a major global public health challenge. It is the most common childhood disease, but it affects people of all ages throughout their lifetime. 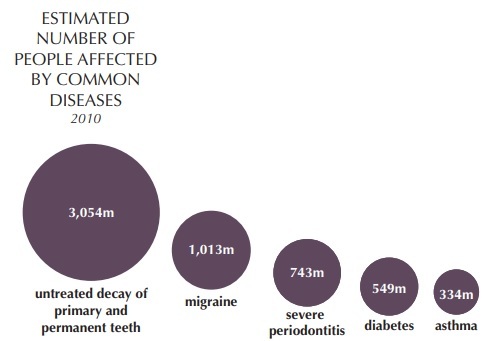 Current data show that untreated decay of permanent teeth has a global prevalence of over 40 percent for all ages combined and is the most prevalent condition out of 291 diseases included in the Global Burden of Disease Study. Another very common disease is periodontitis, which means inflammation of the gums and supporting structure of the teeth. Periodontitis starts with gingivitis, where the first sign is bleeding from the gums. I think many of you have experienced early stages of this, when you are flossing your teeth and the gums start bleeding. 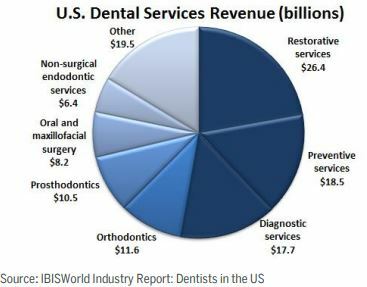 The U.S. dental services is today a market of more than a 130bn USD. The European dental market is valued at above 80bn USD. The U.S. dental market is growing at an average growth rate of 5.8% per year since the 1990’s. 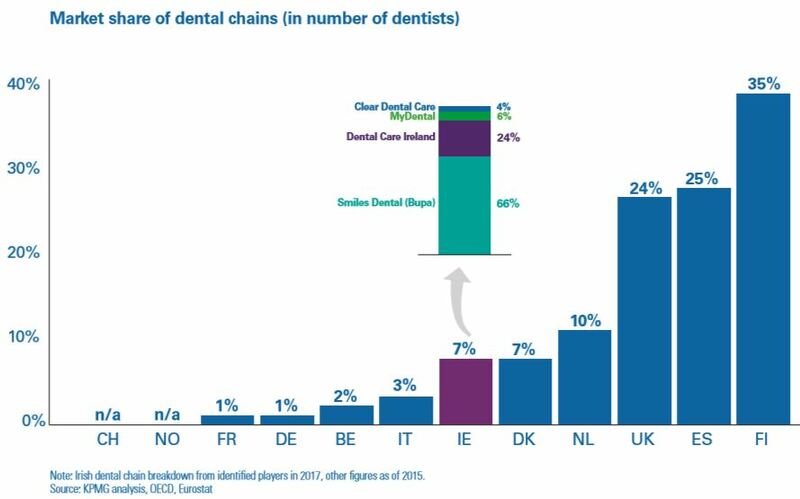 The European Dental market is a more mixed picture, but on average it is growing at a slower pace of 1-2%. 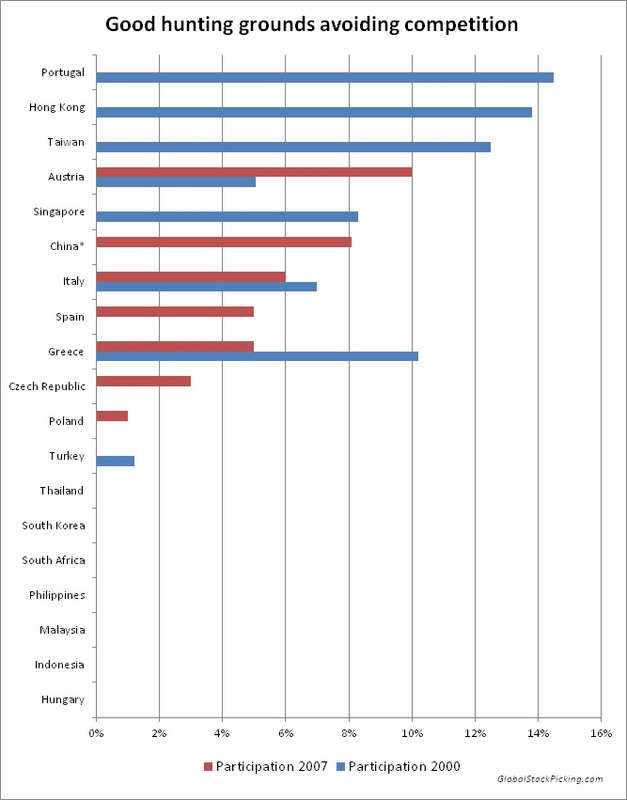 For the Asian region the data is much more scarce. Large countries like China and India has not come nearly as far as the highly developed countries, but growing at significantly higher pace (from low levels). Restorative – Dental fillings, dental crowns, procedures treating damaged or decaying teeth or gums. Preventive – Routine dental exams, cleanings, fluoride and sealant applications. Diagnostic – Digital radiography and x-rays, etc. Orthodontics – Treating improper bites and misaligned teeth. Prosthodontics – Artificial teeth, partial or full dentures, bridges and implants. This also includes veneers, a thin layer placed over a tooth and other types of tooth restoration. Oral surgery – reconstructive surgery, jaw alignment, dental extraction. This segment also include cosmetic surgery to the jaw. Endodontic – Root canal procedures and other treatments related to the pulp of the tooth. Other – Includes services to dental practices, distributors, software solutions, HR, marketing, financial planning etc. Within all these areas the are a number of large to medium sized companies providing different products and solutions to the dental clinics. In coming posts I will dive into some of these segments and see what kind of investment opportunities we can find. This fragmentation seems to have been something the Private Equity firm have picked up on. Obviously there are synergies to be had by running a larger operation. So from a very fragmented market we have seen the early days of some consolidation. This article (Pan-European dentistry is here, but at what price?) though argues that some players have been overpaying. This fragmentation in dental clinics has also meant that the bargain power has been sitting with the dental suppliers. These companies are huge in comparison to the small dental clinics and supply the clinics with all the products they need, to run a modern dental clinic. Given this fragmentation on the dental clinics side, most of the investable universe is with these companies supplying the dentist with their products. A strong motivational factor for spending on dental care is of course just pure looks. To change the appearance by moving misaligned teeth, using veeners, or just a simple whitening. This is a fast growing segment in the market, where products like Invisalign has grown tremendously. These procedures though are like cosmetic surgery, a luxury product, which will cost you a lot. The Invisalign procedure will cost you anything between US$4000 – Us$8000. Very few people in the world can afford to out-of-pocket front the full bill for dental care when more advanced procedures are needed. 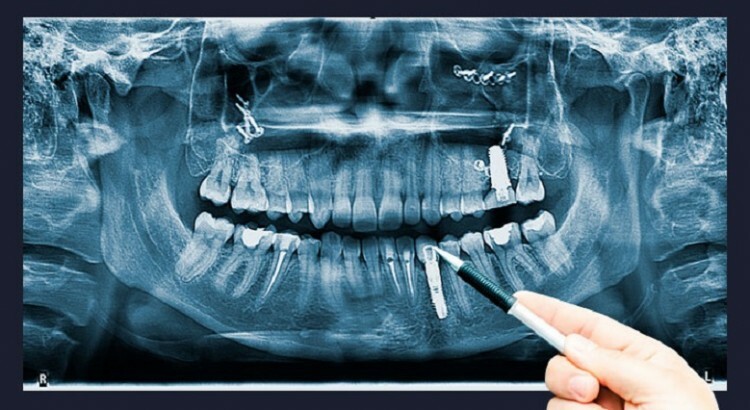 Replacing a lost tooth with a single implant will cost you between US$2000-$6000 depending on where you are in the world. Since dental issues, like a lost tooth seldom is an emergency, we end up with a lot of untreated cases. Because of the high prices, the dental market is to a large extent driven by the level of government support. 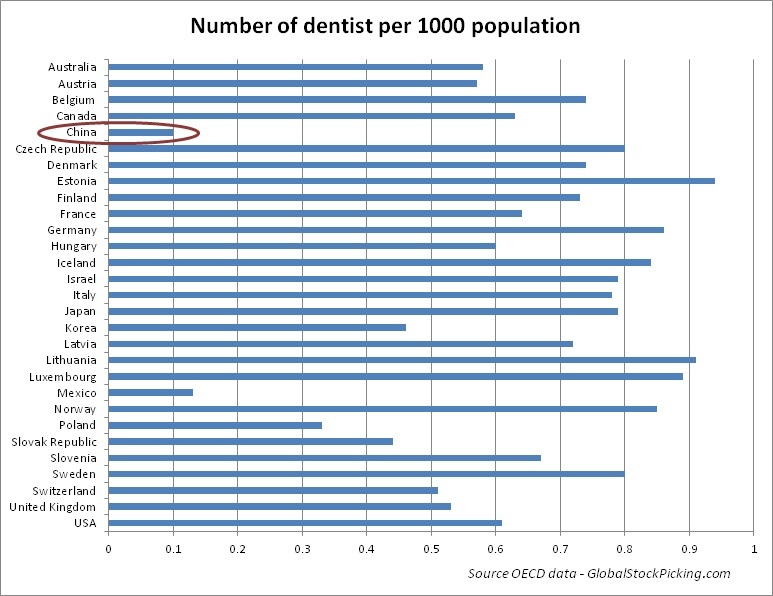 Few countries has totally free dental care to the whole population though. 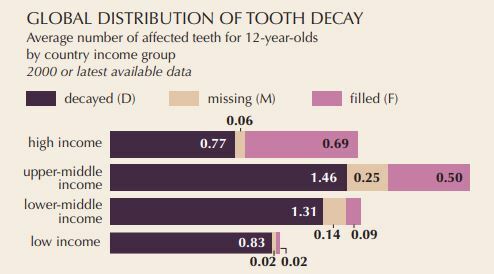 A rich country like Australia for example seems to have a very lively debate on this, where even young people go with untreated tooth decay: The dental divide – and the decay of public dental services. Countries like northern Europe which are famous for their welfare states, have free dental care for kids up to around 18 years of age. Even in these countries adults have to pay, although there is still usually some type of back-stop coverage from the state. For example in Sweden 50% is covered between 3000-15 000 SEK and 85% of the amount above 15 000 SEK is covered by the state. This kind of coverage is similar to expensive health insurances in other countries which include dental. For example the health insurance I myself have (global coverage), covers 80% of my dental bills. Even if this sharing of cost helps, people still need to pay out of pocket fairly significant amounts when doing a larger change, like implants or dentures. 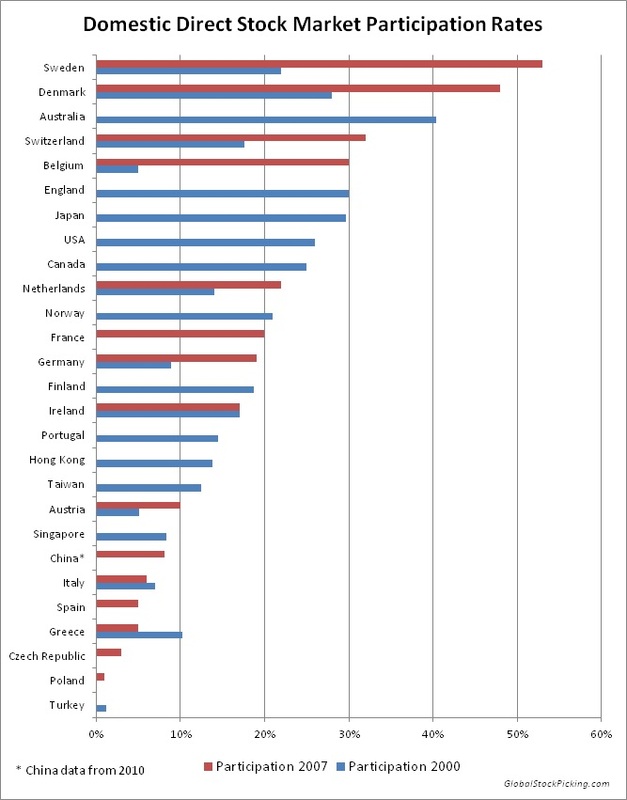 So the growth of dental care is very much up to governments willingness to pick up the bill. The other factor is is increasing overall wealth, like in China, where a rising middle-class is deciding to start to pay themselves, either out-of-pocket, or through better health insurances. To reach a larger part of the population, price is obviously an important factor, if companies are able to lower prices, volume will follow. I hope this set the stage for a series of posts on dental related companies. Do you have any investment favorites in this market segment and why? Anything you would like to add in terms of important industry trends? Please leave a comment! Now over to something more fun than my under-performance, which I’m not too worried about, its bound to happen, especially when you have such large regional tilts. The idea is to keep the main focus on the long-term portfolio. This bucket contains about 15 stocks and carries the majority weight (65-90%) of my total portfolio . Given a 5+ year holding period, this implies that I should not change more than 3 holdings in a year. I did not put that as a strict requirement, because sometimes more action is needed. But the Target Holding Period defined above is really there to imply that this should be a low turn-over portfolio of great long term holdings. I have been following stocks and the market so long now, that I see stocks that are miss-priced for one or another reason. When I see the risk/reward as favorable, I now have the flexibility to take part on a more short term basis. The analysis on my side here could be anything from very deep to more shallow. 1. I spend quite a lot of time researching and reading about these kind of stocks. I think I sometimes actually have an information advantage (that is yet to be proven). 2. Because its fun. Investing is mostly serious business, but it should also be fun and exciting. It will take some time to have a portfolio that is fully in line with the above buckets. I think for example the Opportunistic cases I present today are not the strongest ideas ever. Nevertheless I think they are good enough to enter my new and shiny three bucket investing strategy. Below I will go through what has to leave the portfolio. At a later stage there still might be 1-2 long term holdings that needs to be evaluated if I’m really comfortable holding long-term. Since I bought into Kopparbergs I spent quite a lot of time, Peter Lynch style, looking at cider products in stores around the world. Walking around daily life, like in a supermarket is just full of investment opportunities don’t you think? In fact this is in general something I draw quite a lot of inspiration from. The more important step in that process is both figuring out what you think of the product compare to its competition and more importantly, how other people feel about it. In the case of Kopparbergs, I think that competition has stepped up significantly and consumers are now having choices similar to Kopparbergs. Kopparbergs more or less created a new cider segment, with very sweet cider. From what I see in stores, although less sweet, for example Carlsbergs Sommersby cider is extremely popular. My case was that Kopparbergs cider had a good chance of being a hit in the US, I now changed my mind about that and see it as less likely. Kopparbergs product offering is not strong enough to really stand out in this competition. Another important factor is that selling these products is as much about distribution and network as in having an awesome product. For all the above reasons I decided that the likelihood of Kopparberg continuing a strong growth journey in cider sales, is low. A behemoth in property services, mainly related to cleaning with almost ½ million staff is an impressive entity. 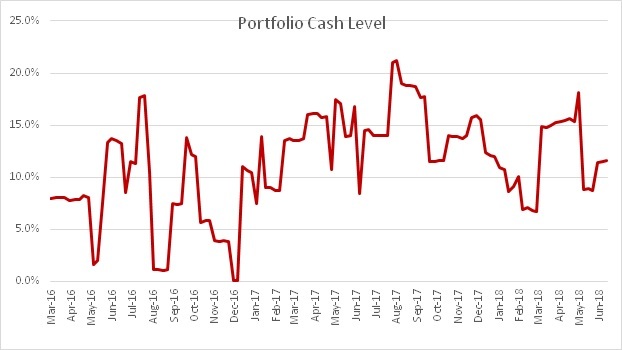 My investment thesis was a turn-around in free cash flow after paying down debt and after that a significant dividend increase. That didn’t really play out as planned and the stock market has also been as disappointed as I. Selling this holding is for totally different reasons though and that for me is too low growth opportunities. This is a steady (potentially) high dividend paying company. Although high dividend stocks have many nice characteristics, it’s not really what I look for in a long-term investments. There has to be both growth and dividends. Mature businesses which are just fighting with operational efficiencies is not what I believe will generate alpha long term. It might do so in a bear market, given the stability and quality of the company, but I’m not going to hold ISS as a timing play on a bear market. I’m usually pretty tough on myself and my investments failures. That’s because I’m not here to brag, but to become a better investor. But now I will do a bit of bragging. Damn it feels good when you are spot on in an investment idea. I painted out a investment scenario whereby HNA would be forced to sell it’s position in Rezidor (now renamed to Radisson). On top of that I had listened to a 3.5 hour investor presentation on how the hotel group was going to structure it’s turn-around. So it was a double whammy turn-around + bid case. As it happened the market started to believe the turn-around, especially when it already started to show in the latest results. Then came the bid by a Chinese hotel company: HNA sells Radisson Holdings to Jin Jiang-led consortium. Unfortunately this bid did not give as much of a stock price bump as I had hoped. 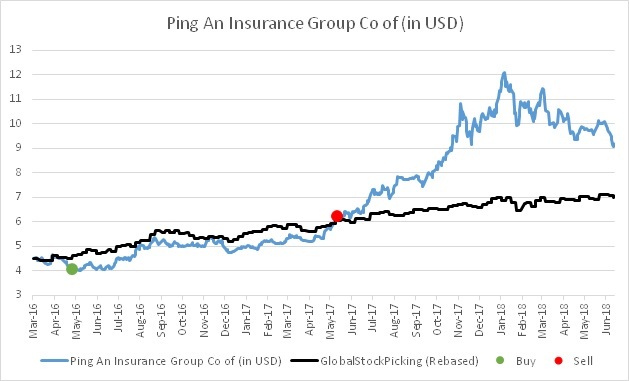 There is still some un-clarity around how much Jin Jiang will need to offer the minority holders, but they might low ball investors and keep the stock listed. There still might be more upside here, but my investment case has played out and I’m happy stepping off here, overall a great investment which returned 39% in less than 6 months. Since my previous investment in Xtep, I have both researched and followed the Chinese sportswear and sport shoe producers in China. I invested in the one (Xtep) that was trading cheap on all kinds of metrics. If I had taken a more long-term approach, perhaps I should have considered the local champion Anta instead. Anta which is a 13bn USD MCAP company recently showed a tentative interest in bidding for Amer Sports, a Finnish holding company for a long list of attractive brands/assets. 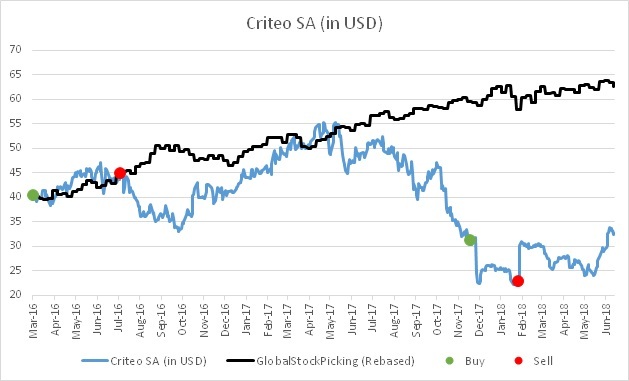 The tentative offer was at 40 EUR per share and the stock quickly after repriced from 29 EUR to 36 EUR, but has after that come down to 34 EUR. If one wants to play mathematics on that, one can say the market is pricing about a 50% probability of this bid actually going through. I liked Amer Sports already before this bid and had already done a quick due diligence on the stock. Even if the bid falls through, I’m not in panic mode holding this stock, it could convert to the long-term time bucket if I did a deeper due diligence and like what I see even more than I already do. There has already been other speculations that Amer might spin-off parts of its business to unlock value. The market is way too skeptical on the bidder in this case. I take this as typical “China fear”. This investment, so makes sense for Anta. If and when it goes through I will be very compelled to add Anta to my long-term holding bucket, I think they would do great things with Amers portfolio of companies. We have Winter Olympics coming up in Beijing 2022 and Amer holds several “winter” assets. Anta has the network in China to actually being able to grow these brands in this tricky market, in the past Anta has bought the China rights to the at the time quite poor brand Fila in 2009. They have totally re-positioned the brand in China over these years, growing it into a real success, from 200 to over 1000 stores in the country. I put the probability of Anta being serious with this bid at 90-95% and I take the probability of a successful takeover somewhat lower (85%), since there is some overhang with for example USA wanting to meddle in this, given that many of the brands under Amer are tightly related to USA. My own expectation is that this should be priced at 85%*40 + 15%*29 = 38.35 EUR, giving about 12.5% upside on current market price of 34.1 EUR. In this pretty brutal China sell-off I have been scratching my head if and when I should poke my hand in trying to catch any of these “falling knives”. I somewhat randomly felt that now would be a good time to catch one of the stocks I have been looking at for quite some time. JD.com is the case of a quickly growing e-commerce company with tremendous revenue growth. The company plows all of the cash back into investments in its own business and other businesses. For example it’s a co-investor in Yonghui Superstores, which my largest holding Dairy Farm owns 19.99% of. For a primer on JD.com I kindly refer to Travis Wiedower who presents the case in his investor letter: JD.com in Letter, EGREGIOUSLY CHEAP blog. A pretty disastrous allegation having hanging over you, I will refrain from speculating in the probabilities of this being true. The main point here is that at this stage the company is bigger than Richard. Yes, Richard built this company and yes this will have a negative effect on JD’s perception among the Chinese. What did Richard do in the US when he got arrested? He was actually studying at Carlson School of Management to complete the American residency of a US-China business administration doctorate programme. Having time for these types of studies shows that other people are running the company by now. There is some issues with the governance structure if Richard would be imprisoned, but we very far from that right now, he is not even charged yet. Richard has built a fantastic business in China, in many ways better than Alibaba’s model. My best guess is that these allegations will die out and JD.com will on a 1-2 year time horizon trade significantly higher. When/if this allegation overhang is removed, this might move into my long term time bucket. The company listed in 2013 under the name Mindmancer. The idea was to provide smart camera surveillance systems to construction sites, schools and such. The whole package of software imagine recognition, cameras and installation was provided by Mindmancer. They had some success and have installed this in numerous places over these last ~5 years. The problem was that the business model didn’t scale and it was hard to keep the company profitable. There was also management issues, where one of the founders, a very young an enthusiastic guy was the CEO. He probably had the heart in the right place, but was to inexperienced to run and grow this company. The largest shareholders which is connected to the University in Sweden where the company started, decided to appoint a new CEO, change the name of the company to Irisity and do a rights issue (24 MSEK at 7.8 SEK per share) to strengthen the balance sheet. After that the new CEOs strategy has been to go for scalable sales model, just selling the software they develop. The software is proven in all the live conditions where it has been installed already. They are going for so called Software as a Service (SaaS) model. Somewhat surprisingly this quite quickly has got a lot of interest from market participants, both G4S and several of the worlds largest camera producers. “Irisity AB (publ) signs license agreement with Hangzhou Hikvision Digital Technology Co. Ltd.
Hikvision is the world’s largest supplier of innovative video surveillance products and solutions. With 20,000 employees, including nearly 10,000 in R & D, the development of intelligent cameras leads. Hikvision is listed on the Shenzhen Stock Exchange with a valuation of USD 46 billion. The company shows a strong YoY 32% growth, with sales of USD 6.6 billion (2017). 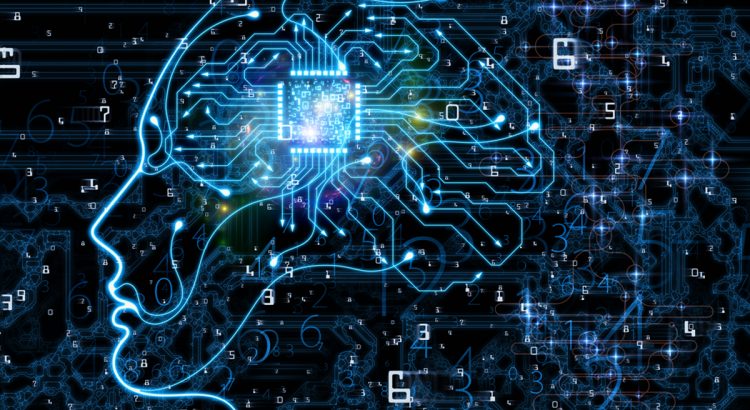 In collaboration with Hikvision, Irisity now evaluates embedded integration of IRIS ™ AI software in Hikvision’s camera platform. What is not mentioned in the press release is that Hikvision produces almost 100 million cameras per year, so the potential is gigantic if these companies really like the Irisity software. So to summarize, the company has a proven product in the Nordic markets. They are currently trying to convince huge players, that its software algorithms are good enough. In a best case they would want to pay Irisity to embedd them in their products. Right now this license agreement is not worth any money, its just shows that Irisity has got to actually showcase their products and on some level for example Hikvision (several other big companies are doing the same) is evaluating their product. I find Irisity (valued at about 35m USD) at a very attractive risk reward right now, even if the probability is very low to see large orders. This is truly speculative, one of these lottery tickets, but with much better odds than playing the lottery. 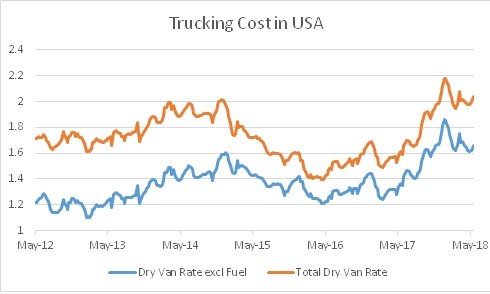 This is a fairly simple case, market analysts seems to think that Day Rates should normalize. They have not done so, so far. Equity markets have given up and stock is tanking (ha ha). Taking the long term view on day rates, its seems plausible that they would increase from these levels. I’m a firm believer in mean reversion. 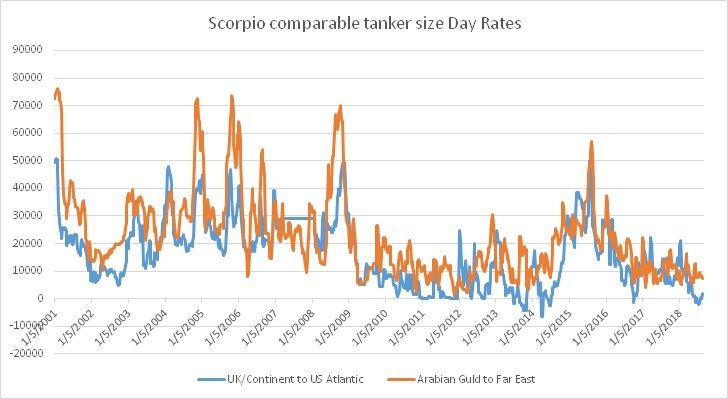 Scorpio has a attractive fleet of new vessels, as long as day rates recovers somewhat, they are highly cash generative. Let’s see if that happens or not. Canadian listed Uranium miner, that I actually owned already back in 2006-2007. At the time, it was the only junior Uranium prospecting company, that actually came out on the other side of the bull and following bear Uranium market. They are now a small scale Uranium producer, with a large portion of their production hedged at higher levels. I will have to write another time about Uranium, but its a very special market and a strong case can be made for long term increases of as its called yellow cake. I’m choosing UR-Energy as my Uranium proxy, because they have excellent management, a very crucial detail in the mining industry, which is full of crooks and cheaters. Please comment what you think of my new holdings and I will try to follow up with more details in later posts! 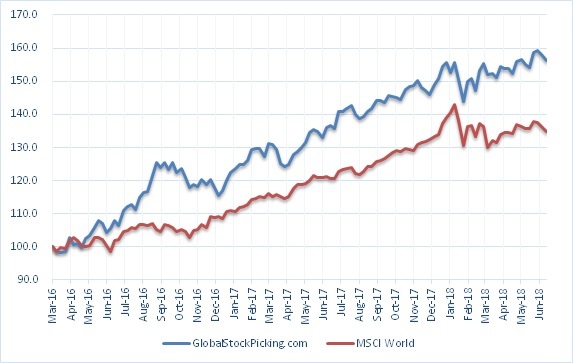 Year to date the portfolio is up +3.5%, compared to MSCI World at +0.8%, both including dividends (so called total return). My portfolio has in the past generated it returns with significantly higher volatility than MSCI World. 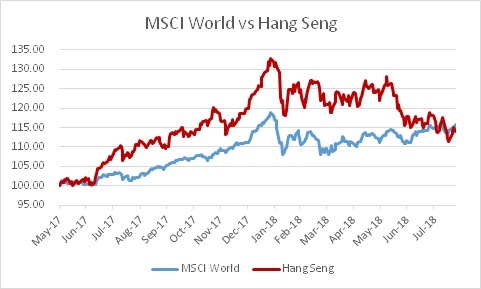 You can almost see it in the graph below how stable the upward trend was in MSCI World. 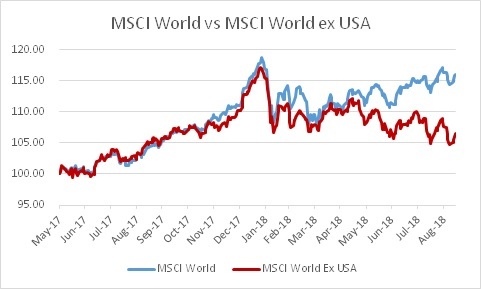 Interestingly enough now this year, when markets have turned more volatile, my portfolio volatility is slightly lower than MSCI World, at 15.2% vs 15.8%. Downside volatility is what counts and I think this is one proof that I managed well to create a defensive portfolio, which has been one of my aims, many other aims were discussed in my previous post earlier today. Some comments on the largest gainers and detractors during this year. 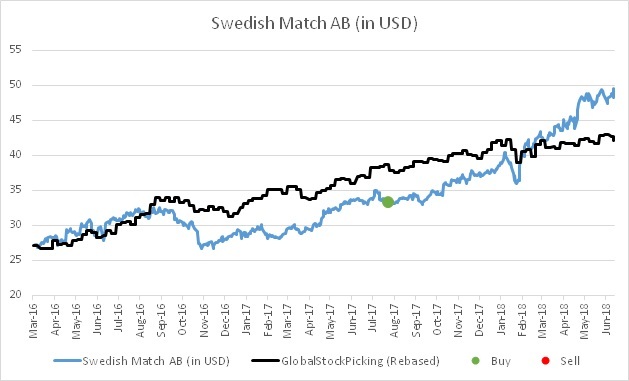 The Swedish tobacco company has performed very strongly compared to its sector colleagues. Then again Swedish Match is a very different company selling smokeless tobacco products. For the interested reader this is a good primer on snus: New York Times on Snus. Except good results, one reasons for the strong share price performance is spelled ZYN. Which is a tobacco free nicotine pouch, which recently has become a big hit in the US. Swedish Match has recognized this and is spending 60 MUSD+ in increasing capacity over the coming to years of ZYN. Valuation short term is a bit stretched, if I had a larger position from the beginning, now would be the time to scale down the position somewhat, unfortunately I started of with a very small position. I’m willing to continue to hold 5% of my portfolio in this excellent company. One of my two funeral company investments, they truly went in opposite directions. In a very poor market environment this stock has been on a tear since I invested. The price momentum strength in this stock is almost a bit scary considering how weak the Chinese markets been lately. At these multiples/levels I have to say I’m close to scaling off a bit of this position. That will depend on if I find somewhere better to allocate my money. 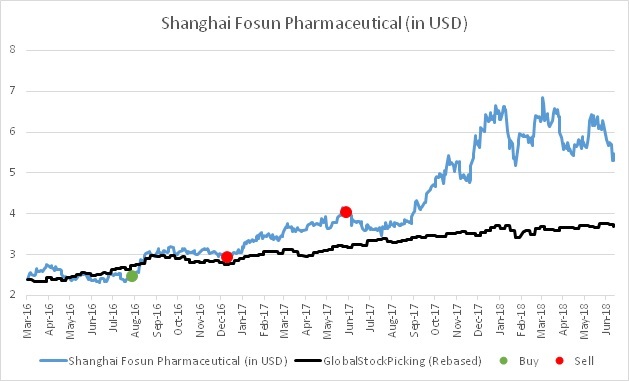 Here I also want to mention my fellow blogger who wrote an excellent analysis on the company: C for Compounding on Fu Shou Yuan. Another new investment that also just kept on its upward momentum. Since I did my analysis on the company I have understood a bit better what kind of plastic toys is driving this fast growth. The understanding came from a deeper analysis of newly US listed Funko. Basically a lot of the Funko’s toys called Pop! are collectible items. Just search for it on Youtube and you will find a lot of people like this guy: Funko Pop collector. The funniest one I found was a contract written up between husband and wife: Funko Pop contract – Limiting spending. This makes the picture a bit more clear how Funko in just a few years has become such a big player in the plastic toys industry. I see this as one of my strongest investment cases, therefor it also carries a large weight in the portfolio. My second funeral stock has not done nearly as well the first one. I decided to double up in this stock after the fall of 50% in one day. That seemed like a very good move for some time. Actually I was close to making up the whole loss about a month ago, then the stock was hit again. 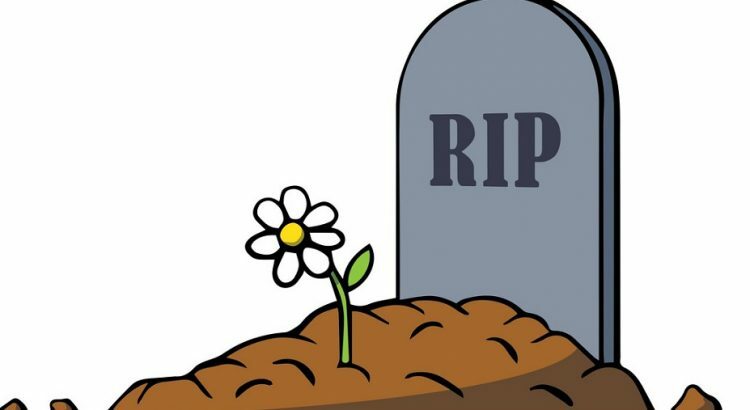 This time it was due to UK’s CMA (Competition and Markets Authority) who launched a review of the countries funeral sector, to make sure “people are not getting a bad deal”. It seems after this most investors have given up hope on the stock. I haven’t really given up yet, since the reason for the rebound after me doubling up was that actual results came out much better than anticipated. We are still looking at a totally non-cyclical company, with a estimated P/E of about 11-12 and a dividend yield of 2.4%. As mention in previous posts, the worry is the debt load in case profit margins fall significantly further. I’m stubbornly keeping this one. After being one the portfolios true outperforms and a holding I had for a long time, LG Chem has given back much of that out-performance over the last few months. The stock is fairly volatile and living its own life, but the downturn is likely due to the oil price. This volatility from the Chemicals division is something I will have to live with, since I didn’t invest in more pure play like Samsung SDI. The reason why I’m owning the company is not due to the Chemicals division, but because the company is truly in the forefront of EV battery production. Now we are 1-2 years out for the start of really widespread EV sales from all the big car companies. My plan is to ride this whole wave and hopefully hold this company for another 10 years. Similarly my idea with Coslight was that it could become a Chinese large player in the EV battery space. I’m less sure now than I was 3 years ago that actually will be the case. Not because Coslight is not going to try, but because the company does not really have the financial muscles to build up huge modern EV production plants. Like for example the newly listed CATL can do, or BYD for that matter. Coslight has proven itself as one of the largest producers of laptop batteries, so they have the know-how to make batteries cost efficiently, but I’m starting to feel less sure if that is enough. They sold of a portion of one of their factories to reduce debt and free up capital to invest further into EVs. Overall it was a good move for us that wanted the company to move towards EV battery production, but the market has not really received this news well. A tricky holding I followed for a long time, before I had a lot of conviction. I think the reasons why I’m not giving up on this company, is that they have truly hidden value within the firm. Strangely enough (due to the majority holders son) the other leg of the company is video/mobile games producer. The best case would be if they decided to list the games entity separately. The games developer might be valued at perhaps a third of whole Coslight’s value, given the multiples on games developers these days. As you can see from my discussions above, some holdings I’m happy with, others more worrying. Given this, I still need to keep up the hunt for at least 2-3 new investments. I will also consider if I should increase the weights in some of my current holdings, to not keep cash levels too high. In general that has been a problem in the past and really big performance detractor, since I calculate 0% return on cash. Its been a few slow weeks for me with vacation, which is usually when I find time for reflections and lessons learned. My thoughts below are a continuation of this post 6 months ago: Portfolio changes larger reshuffle Part 1. I started out this blog and investment portfolio in March 2016. My portfolio at the time had a heavy tilt towards Hong Kong listed companies and holdings with exposure towards China. The big theme I had been researching for the past year, before starting the blog, was Electric Vehicles and this theme had a large presence in the portfolio as well. That was my starting point almost 2.5 years ago, since then I realized a lot of things on how I should build my portfolio and only three of the starting holdings are still around. A picture says more than thousand words, so I will try a new format here showing the buy and sell timings of some of my holdings. The performance for all stocks is restated into USD, since my portfolio is in USD. 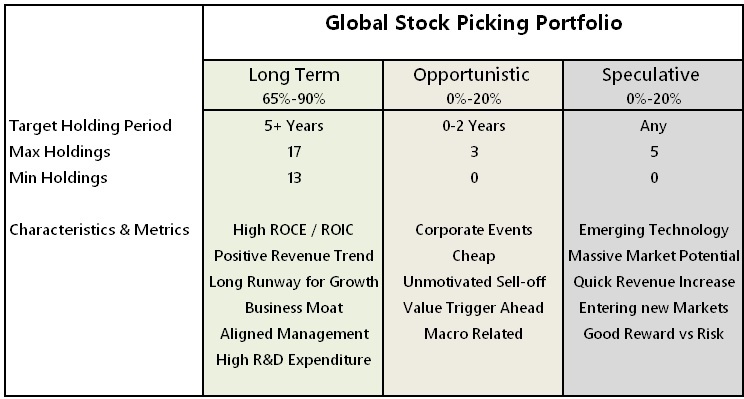 As a reference the GlobalStockPicking portfolio performance is also shown, rebased to start at the same value as the stock price. The data series looks slightly choppy since the GSP portfolio returns are only calculated on weekly basis. 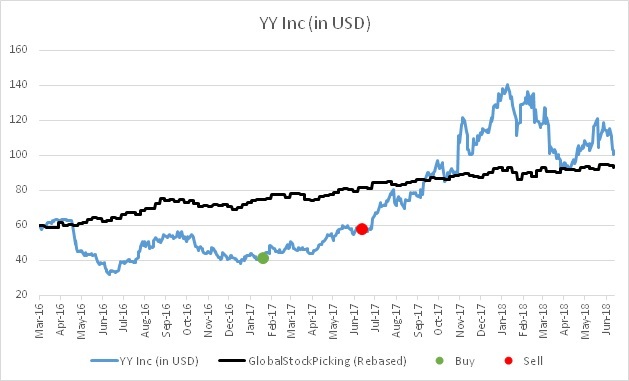 My main focus for quite a while has been to find new investment cases and at the same time becoming a better stock picker. The stock picking was needed, to find new type of investments when I decided to start reshaping my portfolio. As important is the portfolio management, side, what should I be looking for, and what kind of companies do I want to have in my portfolio? The starting point of that reshaping was to say, what I did not want to have too much of. 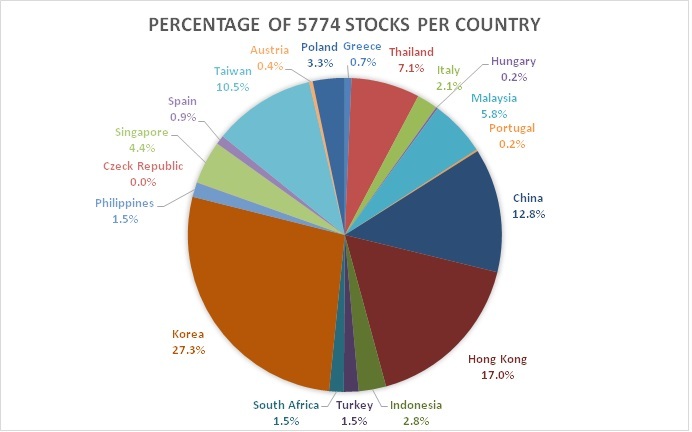 In step 1 by decrease my portfolio country tilt, away from China (Rotate away from China). This was done in somewhat of a haste, since my bearish market view meant that I thought a stock market downturn was imminent. My views were based on that I thought the Chinese economy was (and still is) severely overheated, with all the stupid investments that goes along with such a overheating. In this haste to transform my portfolio, I tried to replace the Chinese holdings with less cyclical and defensive companies (like Huhtamäki and ISS). I have to confess here, these investments were made without going the full mile in due diligence. Of course I had done some sort of due diligence, but not really drilling into detailed valuations. More recently I understood that I bought some of these holdings at fairly stretched valuations. 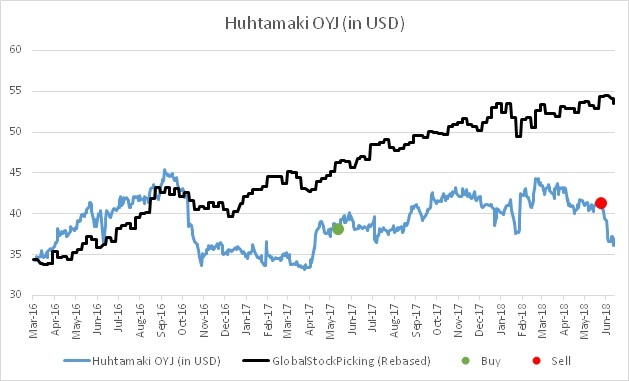 I just sold my Huhtamäki holding and I would say the next holding I’m closest to selling right now is ISS. 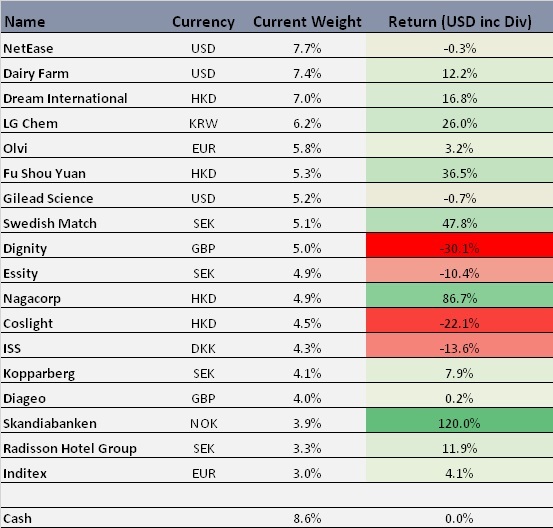 Other non-cyclical defensive investments, like Swedish Match, has performed extremely well in the last year. 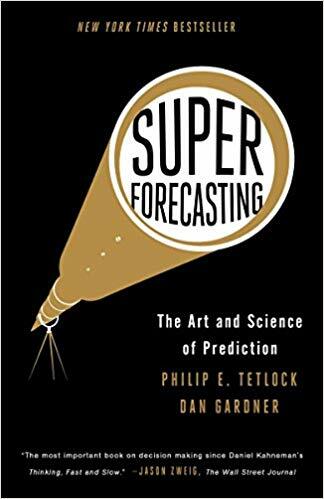 Lessons learned from this: Don’t overthink Macro, it still OK for me to make a Macro bet that something big is going to happen in the future. But starting to rush into new investments due to a Macro call of rotating away from China, is not OK anymore. It is very rare that there is such a rush to act, take the time to fully analyze what I’m buying before jumping in. I also have a tendency of finding some new investment and get very excited. It gets even worse when the stock is trending upwards and it feels like I’m missing out, classic FOMO. Investing in this way is not acceptable for me anymore, I have to do a proper deeper due diligence before anything goes into the portfolio. Although I have not formulated that here on the blog yet, this is something that has become a hard requirement in the last six months. My bearish China view obviously did not materialize at the time, rather Chinense stock markets continued to outperform for quite a while. 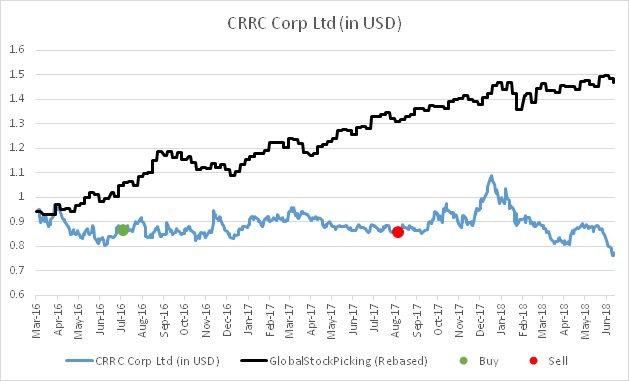 Most of the holdings I sold, outperformed massively and only one, CRRC performed fairly poor. More recently though, Chinese stocks have turned bearish, with Trump trade wars having the most sever implications for China. Another lesson learned here is to scale out of winning holdings, rather than cutting the whole position. Sure the stock could be more closely to fully valued, but momentum should not be neglected. Both in terms of stock price momentum, but usually the stock price increase is on the back of better fundamentals, where there is usually also some momentum, bringing the valuation downwards all else equal if you just hold on for a while. 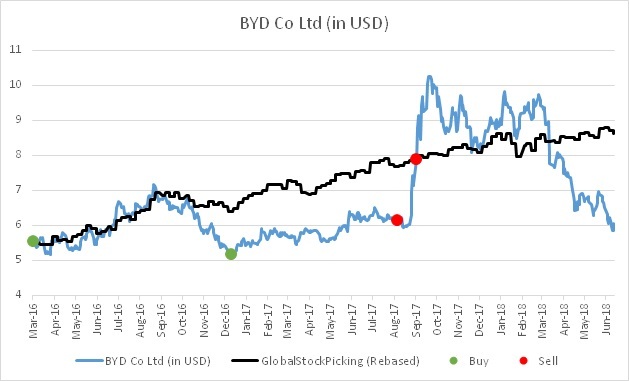 The way I sold out of YY (Further China reduce Sell YY), on a China Gov clampdown scare, rather than valuation, and how the stock afterwards continued to soar, that is hurtful to look back at. I stated a quite long term ago, a desire to have less portfolio turnover and take a longer term view on my holdings. The next step of the portfolio transformation was something I realized I had to do, to come closer to such a investment style. That was to remove holdings that is hard for me to fully understand. Meaning companies that I spent quite a lot of time understanding, but the nature of the business just makes it very difficult to fully penetrate. I had a discussion with value and opportunity blogger on this. His comment was that its no point in fooling oneself that you will ever fully understand any business. I agree with him, but the point for me is to understand the company to such a level, that even if a lot of factors around the company changes, I at least have a reasonable chance to grasp what does the changes mean. Hopefully I will also be able to understand if a stock price fall is warranted, or if its just market sentiment shifting. My experience is that when a stock just keeps rising, it doesn’t really matter how well you know the company, it feels great owning it anyway. The stock price increase just confirms how right you were buying it. Its when an investment falls significantly that your investment thesis is really tested, then at least I need that confidence that you understand the company well. I felt there were some holdings I would never reach that understanding of, at least not without a very serious continuous research effort. 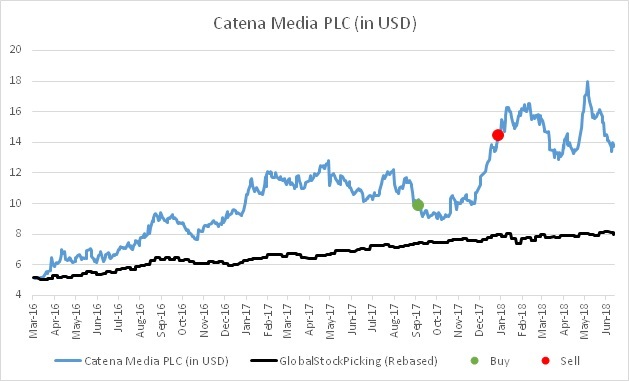 Companies that had to leave for these reasons were Criteo and Catena Media, one being one of my larger laggers and the other one of the largest gains. 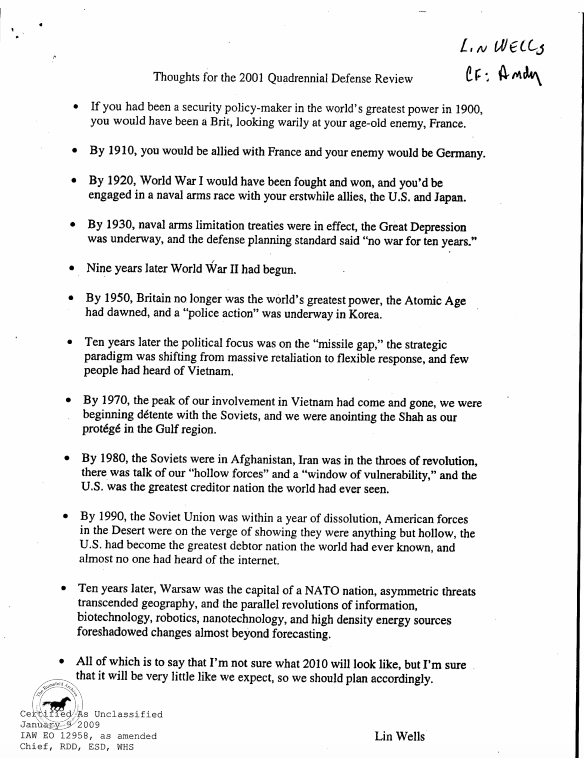 Part 3 – Long term yes, but to what cost? The main reason why I want to be long term in my investments, is that I firmly and strongly believe that one of the last untapped pockets of easily available alpha out there, is to have a longer term investment horizon than the market in general. Given that we want to be long term investors, how do we merge that with an analysis of the current valuation of the company? Should I buy great companies that currently looks very expensive, because they will do great long term? I think there is more alpha in finding great companies, that also currently have some margin to safety. That means you both are looking at good returns just from the business growing, but also a one off multiple expansion, as the market also realizes that this is a great company. In the very very long term, that multiple expansion probably does not matter as much for total return, but when I say I’m long term, I do not mean 30 years, I mean that I have an investment horizon of 5-7 years. Finding such companies is the ideal case, usually it’s only possible to find these among small caps, which then usually comes with other problems. So it doesn’t mean I never buy companies that are trading at high multiples, it all comes down to what opportunities are available in the market as well. Inditex, Diageo and NetEase are all examples where I paid up an fairly high multiple, clearly there is little multiple expansion to hope for, rather I just think they are great businesses which will continue to do very well, again, long-term. Stock picking/research is what I enjoy the most, but it is also a time consuming process. 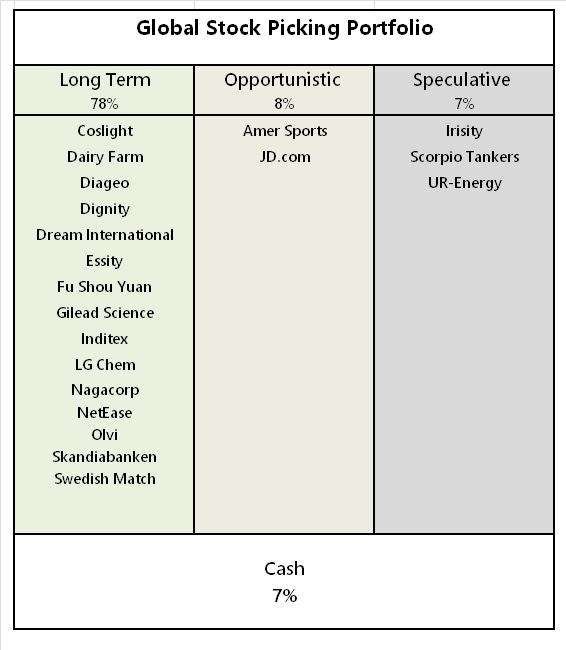 Before I present a new investment case for you, I have looked briefly at many different companies, done a lighter due diligence on 5-10 cases and one of these hopefully is interesting enough to add as a new holding in the portfolio, which is then presented to you. I do not spend my time doing full write-ups of companies I do not invest in, just because time is precious, and I don’t have enough of it, to “waste” my time doing nice write-ups of something that I’m not investing in. The only exception was Teva, and that was a stock I thought I would invest in, but during my deeper dive, I changed my mind. Another lesson learned, is that I need to become more time efficient in my stock screening/searching. Currently my screening process is very much random, reading about one company leads me to another company and so on. 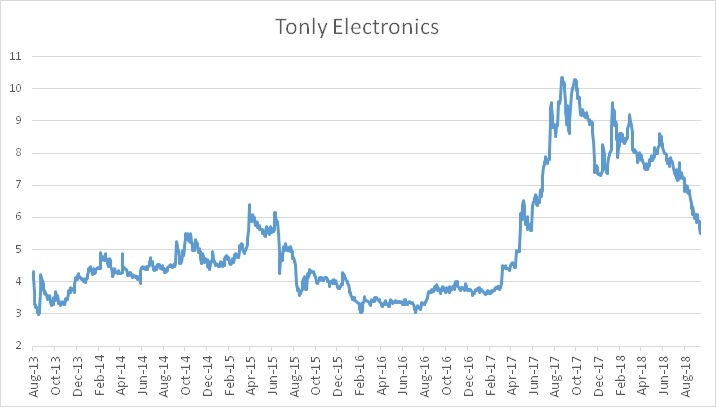 Another way has been a general investment idea around for example electric vehicles, this leads me to read up on 10-20 companies in and around that sector. In the past I have done certain screenings, for example I screened for all brewery companies world wide, which led me to investing in Olvi. I have also done some screens on Australian and New Zealand listed companies, where I still currently have a few stocks on my observation list. Since my investment universe is global I think I should utilize this more in the future and use screens/filters as a more efficient way of generating ideas and companies I would never otherwise find. Having limited time and resources to find investment cases marries well with being a long term investor. Long term investing gives the opportunity to extract alpha where few others are looking. For me only certain types of companies can become truly long term investments. For example the company should be fairly easy to understand. I should focus my search and research on long term type of investments and also try to come up with a screening processes which makes it quicker to find such companies. No more rushing into new investments and never make hasty portfolio changes due to changing Macro, better to be late and do correct portfolio changes than rushing into new holdings. When a company re-rates in the market and starts to look expensive, do not sell the full holding, rather scale back the position, my track record shows I’m often not just early to sell, but way too early. Something of a let your winners run, cut your losers short strategy, but with less emphasizes on cutting losers.